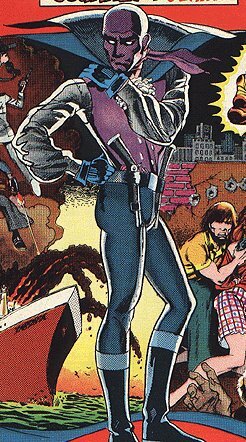 Powers/Abilities: A ghost, he rides a flying jet-black horse and is armed with spectral pistols. History: Matthew Dunsinane was an infamous highwayman in colonial America during the Revolutionary war, hiding his identity behind the mask of the Grim Ghost. But after robbing the coach of Lord and Lady Braddock in 1743, his luck finally ran out. A few days after this daring crime he is lured into a trap by Sarah Braddock, and is captured and unmasked. Three weeks later he is hung by the neck until dead. The dead man's soul was sent straight to Hell, where he is met by Satan. The lord of the underworld offers him a choice. Either he can suffer the tortures of perdition for eternity, or he can return to Earth as an agent of Satan to harvest evil souls him. Under the circumstances, Dunsinane chooses the latter. Matthew is returned to Earth in the 20th century, a time when evil is running rampant according to Satan, literally becoming his former alias - the Grim Ghost. Comments: Created by Mike Fleisher, the character lasted three issues before Atlas ceased publication.